The British Library‘s “Medieval and Earlier Manuscripts” blog is a reliable source of visual delight and provocation to think about the interplay of the print and digital worlds. It also prompts the application of Ezra Pound’s critical technique of juxtaposing works, demonstrated so well in his The ABC of Reading. 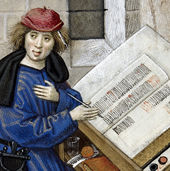 Earlier this year, Ann Tomalak, Conservator, Greek Manuscripts Digitisation Project, posted “Digitising Manuscripts: The Condition Assessment,” a wonderful essay that warrants reading alongside A Degree of Mastery by Annie Tremmel Wilcox. On both occasions ebooks and digital publishing pervaded my thoughts, but only on the second time around did these questions and observations I want to raise now shape themselves as they have. “Weaves” is the precise word for the structure of her book’s narrative, and it would be the right word for her ebook, if there were one. As I re-read it, this game of word substitution yielded questions that make this memoir a useful means to bookmark the evolution of the book. What are the tools of the ebook maker? From whence comes their refinement and dignity — their “presence” — with which the “shokunin” imbues his creation as a result of his commitment to his craft? In what tools of the ebookmaker does “the spirit of the tool that records the ‘shokunin’s’ ability through the years to face the uncertainties of life, to overcome them, and to master the art of living” reside? An English grad student, Wilcox relished handling the University of Iowa‘s Sir Walter Scott Collection, its Leigh Hunt Collection and The Works of Rudyard Kipling. Confronted with earlier slapdash and botched work on certain volumes of the Kipling, she writes, “Certainly these volumes of Kipling are found on the shelves of numerous libraries across the country, but the integrity of ‘these’ volumes as a complete set has been lost.” (179) What constitutes the “integrity” of an ebook or its constituents? Are ebooks so “immaterial” that such a question is nonsensical? What is the “form” of the ebook as we know it? Is the ebook as much “vehicle” as “content”? 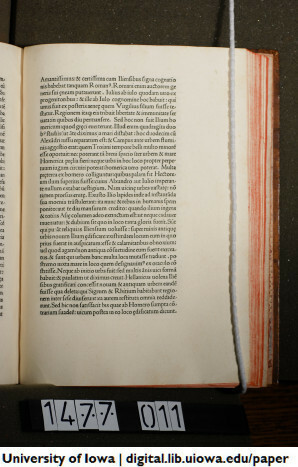 What are its equivalencies to the page or to what “binds” the “text block”? What does it mean to “conserve” an ebook? Of a digital copy, what are the materials; what is the artifact to be conserved? Wilcox ends her memoir with the completion of her “masterpiece,” the restoration of the incunabulum that Bill Anthony assigned her before his death and which she completed after it with the help of “The Restoration of Leather Bindings” by Bernard Middleton, author of the standard text “A History of English Craft Bookbinding Technique.” The work assigned was Pope Pius II’s “Historia Rerum Ubique Gestarum,” printed by Johannes De Colonia and Johannes Manthen in Venice in 1477, which when restored was “not a deluxe edition, but … had great integrity.” In the year 2547, of what will the preservation and conservation of today’s e-incunabula consist? Will some apprentice conservator understand the “form” of these ebooks “in the cradle” and, master of smart tools, restore them to their integrity? With Ann Tomalak’s essay, perhaps we can see that future through her present lense on the past. Give it a read.